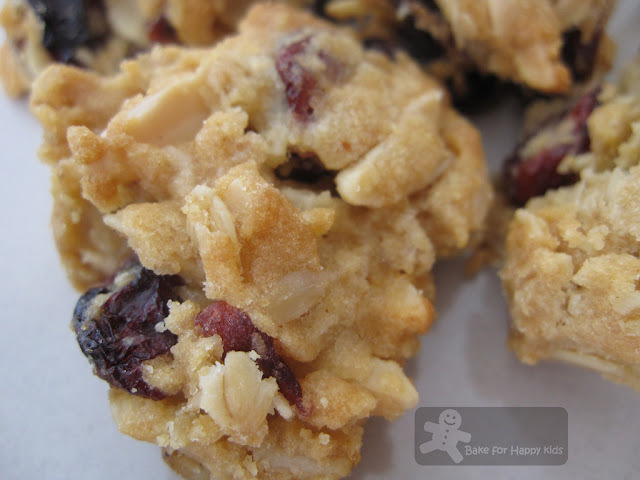 My husband and son love their cookies with lots of butter, chocolates and nuts and they have been fussy having dried fruits in their sweet treats. For this reason, I think I have created more than enough their preferred version of cookies and cakes. Now, I need to be "selfish" this time, baking these "guilt-free" cookies for myself. 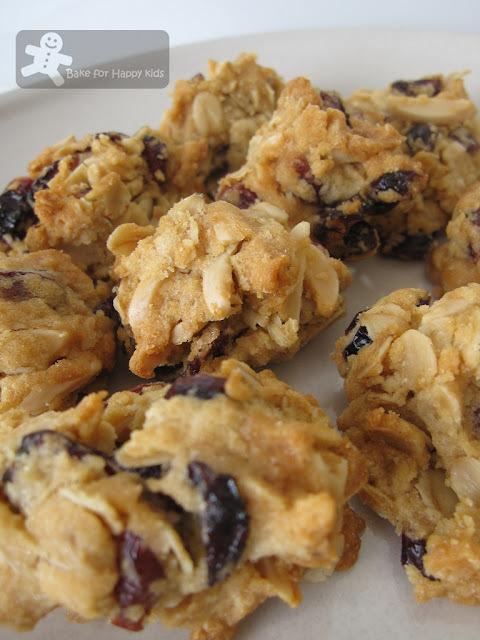 I made these cookies with lots of my favorite dried cranberry, replaced the butter with rice bran oil spread and reduced the sugar content dramatically. I have also added a tablespoon of honey to compensate the missing 25g of fat to help binding of the ingredients. These cookies are crunchy and deliciously good! ...Surprise! Surprise! My son like these cookies too. 2. Combine oats, flour, sugar, cinnamon, dried fruits and nuts in a bowl. 3. Melt butter with golden syrup (and honey) over low heat Add soda and boiling water. Stir warm butter into dry ingredients. 4. Roll tablespoons of mixture into balls, flatten with hand (I didn't do this), place on tray and bake about 20 min, cool cookies on trays. I like this type of cookies a lot especially all the dried fruits on it and better still it is healthier. I am bookmarking this to try out once we finish our CNY cookies. thanks for sharing. These are beautiful cookies. I would just need a couple of these treats and a good cup of coffee and I would be happy. Very nice. yummy goodness combined in one delectable piece what could go wrong? looks great Zoe! These look great, especially with cranberries, I would add the apricots too, as I love apricots as much as cranberries! I eat anything with a cranberry in it. These look delicious. I love this type of cookies too. These look fabulous. What a neat healthy cookie. They look absolutely delicious and even better, I could eat them without the guilt. Feel like gobbing some rite now.. I bet my son would love these sweet balls too! It looks so tempting! Thanks for sharing. Your healthier cookies look so delicious. It doesn't seem like anything was sacrificed when you revised the recipe. Great photos Zoe. These look very yummy. I also love muesli! And, weirdly enough, with all the snow here in NYC, I've been craving light snacks and not heavy ones so these would be perfect! Your cookies look so yummy! They looks fabulous! Your additions and replacements looks even better in my opinion. I must stop reading your blog on an half empty stomach! Yummy! I try to sneak in the better stuff when I make cookies for my husband and daughter, but my husband almost always can tell. These look great though. This recipe sounds like a winner; love the fact that you improvised with what was in the cupboard; they look so good. wow, what a GREAT idea! i would devour these any time of day!!! nutritional and delicious cookies, zoe. i do like these cookies, i used to have sort like these cookies for breakfast a lot at one time. With a little rascal of my own, I can never get enough of these kinds of recipes. Thank you so much! I'd love to try your guilt free cookies! They look delicious! 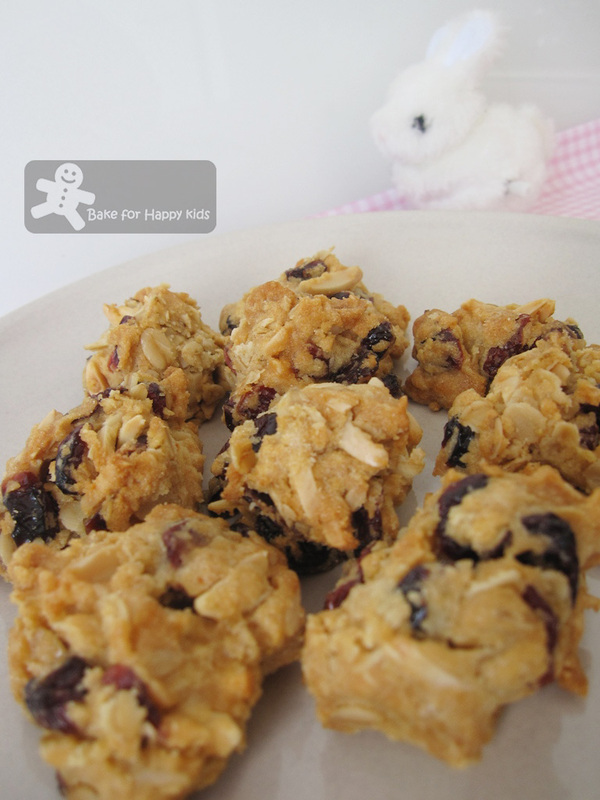 ZOe what a great idea to use muesli for cookies! Beautiful and healthy!